I am tired after a hard week in work, it has been frustrating checking the fine details of papers to be submitted to journals and by 5:30 p.m. I am exhausted. All I really want to do is go home to my warm flat and relax with a glass of wine and a book but I need to shop for the weekend still, so that I can spend tomorrow working on my thesis. So I set out and head to the supermarket. In doing so I walk down a major road, with ice still on the pavement from the snowfall about a week ago, past a few equally weary workers who trudge up the hill to where they live. By doing this I walk through a small area of with quite a high level of social deprivation. However although there are lights on in my home church, I see people come out of car park carrying large black cases which have the outline of brass instruments. there is Samba drums coming from the local community centre, but when passing the high-rise flats not a single creature stirs, not even the overfed pigeons. Nearby is the old Methodist Church that the Jesus Army have taken over and are redeveloping as a Jesus Centre. On the underpass to the supermarket sits Mike, he has his battered blue parker hunched around his thin body, his black eyes sharp in his thin face, and before him sits his cap, waiting for any spare change the straggling passers by might put in. I stop and ask if he is getting on and if he wants anything to eat. In doing so I learn he is seven quid short of his B&B money for the night having ‘slept’ rough the previous night. As I go to buy him his egg sandwich and a chocolate milk shake I ponder what to do. It is clear to me that tonight of all nights nobody should be sleeping rough. I am not sure that ringing emergency accommodation has any point even if I knew the number, which I don’t. I know Mike is in contact with the authorities at least for the last six months. I also have never seen him clearly drunk or under the influence, I know he is ex-services and he smokes. I also know that most of the places I could send him during the day (or better still go with him to) are shut. In the end I give him the £7, he offers to repay, I reject saying that he should do something for himself with any extra. It takes another eight months, a trip to hospital with serious illness before Mike is housed. His first plan on being housed was to go and help at local charity. Now I know I did not fix anything, I maybe gave Mike a bit more comfortable existence for twenty four hours but that is it. I may even have allowed him to get drugs that were the cause of his homelessness in the first place. I don’t know. I do know that one of the problems of trying to help people like Mike, and there are plenty, different stories but similar difficult circumstances, is the fact that they live chaotic lives. Expect them at church dressed in clean clothes at 11:00 a.m. on Sunday, and then to behave politely is just not reasonable. I am afraid the chance of getting them to a church is negligible. Mike was invited at least three or four times including people willing to walk in with him, to a community breakfast at my church less than half a mile away, he never came let alone to Sunday worship with many middle class people. The problem is that in many ways church has to be twenty-four seven in these communities, it is no good expecting them to come when church is open, church needs to be open when they come. What is more they often need more support and effort at least initially than your average middle class person. In order to even start to comprehend the faith they will need a small affirmative accounting community. A place where they are helped to tackle the chaotic forces that rule their lives. Yet I know equally the high cost of trying to do such work. I have lost count/track of the cases of burn out when people have tried. These were people of faith, why else would they do it. Even to live your life in close proximity to these people (by that I do not live in the area, I have done that for years and it can be done with very little contact, but actually living so you shop at their shops, socialise where they socialise) is extremely draining work.You are faced with an overwhelming need that could drain your spirit and your finances very single day. I have come too a conclusion that really only two groups have the ability to deal with such a challenge. On the one hand there are the Roman Catholic orders who specialise in living alongside the marginalised. They manage to do it, partly because they have systems that watch peoples reserves, because quite often the brothers and sisters who do this have as much money as those they help (i.e. none) and because you normally do this as a community. The second group are from the other end of the spectrum and are groups like the Jesus Army, again the do it by living in community, actually by quite strong discipleship and again by having a communal rather than an individual purse. The difference is that people from the area can join the Jesus Army where as the Roman Catholic brothers and sisters would expect people to join the local RC church and are not looking for others to have a vocation to their order. In some ways this makes the Jesus Army more vulnerable to the stresses of the people around them. Which of the two is best? Well the Roman Catholic has the advantage of not expecting people who want to be involved locally to make the commitment the brothers and sisters have made. The supply of people for the presence is not from the locality and what they want is to create a worshipping community around them that will be part of the Roman Catholic Church. The problem is that as soon as you start to help people in these very dire circumstances in a way that really does challenge the chaos, then they normally start rising up the social ladder and quite often end up moving out of the area. So you have an continual mission situation with the need for constant support. With the Jesus Army approach you actually do develop a local community. There are people from the neighbourhood and they tend to stay because the amount they have invested in the Jesus Army, i.e. housing, job and friendship means that leaving is very difficult. What should the Jesus Army do for people who want to leave. They may well have come in with nothing, been given shelter and then experience of employment by the Jesus Army. If that person leaves and the Jesus Army gives them nothing then that person is destitute again and open to fresh forces of chaos. However given the amount of support the Jesus Army gives such people why should it be expected to support them still when they no longer want to belong? It seems to me both are flawed but both work better in these circumstances than standard church model as practised by many churches in this country. Getting the balance right, for there to be a church which really is open to the community will always be extremely tough. I write poems as a way to be creative, normally my poems try to take you into something, this one doesn’t it is polemical. Perhaps it is worth saying that this poem is actually arguing with those that claim that church is only any use because it gives you the chance to go to heaved. This was a mini rant I was giving to my parents and thought it was perhaps worthy of a blog post. Lets be clear, there are certain things that I don’t want to hear from the older generation. Firstly I don’t want to hear them grumbling about the mess the church has got into. Not because the church is not in a mess, but because its a method of seeking to make other people (i.e. the younger people) responsible for getting the church out of the mess. Lets start with facts, the church did not get into this situation overnight, it has taken decades to get into it, and in each preceding decade it would have been easier to rectify than it is now. The people responsible for things in previous decades are now older people. So the grumbling is asking others to get you out of your mess. Secondly I don’t want excuses not to engage with the younger generation. One of the things that has happened is a disconnect between the Church and the vast number of younger people. It started before 1970s, as I can remember sitting in school in the late 1970s and finding myself the only person familiar with the Easter story amongst my class mates in high school (I hope it was Easter, it may have been Christmas). They already did not know the grand narratives of the Christian gospel. That gap is partly your making, help us bridge it. Please don’t think you can pass this onto us. What you tried to do then obviously wasn’t enough because it did not halt it. This means there are fewer of my generation in church than of yours, in case you had not noticed it. Expecting us to make the effort to connect with those younger and provide a chaplaincy service for you that allows you to stay within your comfort zone ain’t fair. I suspect our priorities have to be to get the gospel out to those who are younger than us. So yes things are going to be more uncomfortable for you. Believe it or not, its not half as uncomfortable as it is for us. Now I am really not interested in blame, blame does not solve anything but I am interested in getting you on board, realising that you have a role to play (your retirement from church is cancelled just as mine from work is). What is more it means change, its not the church kids we need to connect with or keep. I am sorry but we have consistently failed to find a way to keep them through college, when grants came in in the 1960s we should have started looking for new ways to connect. Chaplaincy is often under funded and does not connect back to the local congregation. It is the secular 20 to 30 years olds who are just setting up a home in the area. How do we reach them? I don’t know, but we have to try experimenting to find a way. That of course means our resources are directed elsewhere, not to keeping the body of the church functioning as it is, but on trying to develop relationships with people , people who are distinctly different from most of us in their attitudes and ideas. People who are a lot younger and therefore a lot more technologically au fait. So if you are up for the challenge, welcome to the team, we need all the hands we can get, no matter how weak and full of arthritis they are. If you are not, then I am sorry, but we have more important things to do and at least you can stop grumbling. Yes John Calvin did say something about church finances. He said 25% should go on acts of charity and 25% on mission, I think it was also 25% on ministry and 25% on upkeep. Doesn’t sound like any church finances I have ever seen! Okay so in Geneva the council kept up the buildings. So how about 20% on Ministry, 20% buildings, 20% upkeep, 20% on acts of charity and 20% on mission. Sounds simple doesn’t it, but I will bet now that a church that did that would look very different to any church around today! Two things I have come across say things I am thinking better than I ever could. 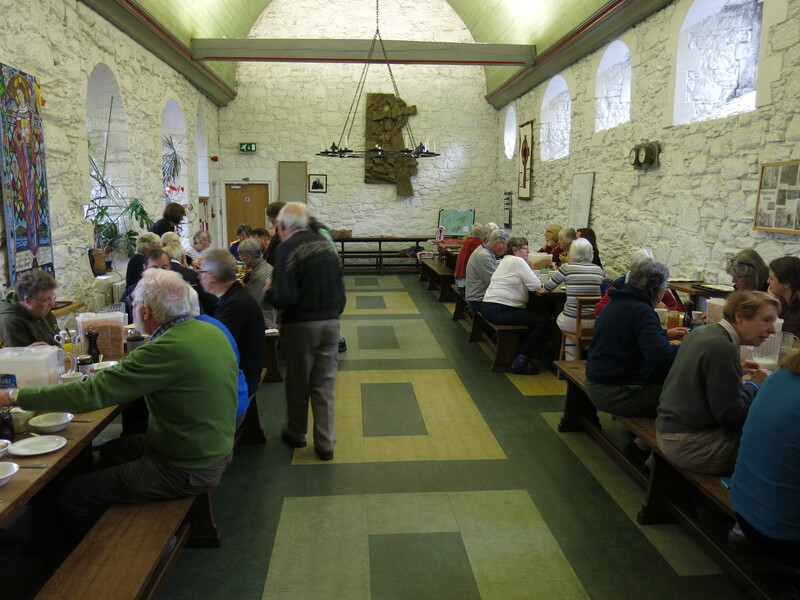 An interview with Malcolm King when he was warden on Iona Abbey which talks of how renewal might just come out of building community. Secondly there is this blog article from the Alban Institutes on why churches need to identifying their primary and secondary customers. It simply points out that the church has primary customers who are not yet part of the church. In other words congregations wrongly define who their primary customers are by excluding a very large number. In fact if the church is to survive then it is dependent on people who are not yet members.